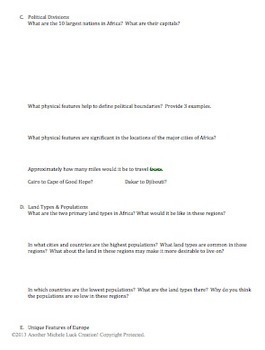 Start your unit of African Geography with this engaging individual or small-group Atlas Introduction Activity. 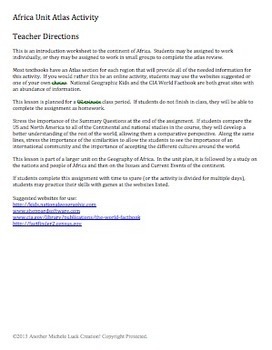 This is a student-centered investigation of the Geography and statistics of Africa for an introduction to a unit on the Geography of the region. Students may be assigned to work individually, or they may be assigned to work in small groups to complete the atlas review. Most textbooks have an Atlas section for each continent that will provide all of the needed information for this activity. If you would rather this be an online activity,students may use the websites suggested or one of your choice. This is planned for a 90 minute class period, but could be split for a 2-day traditional schedule. If students do not finish in class, it would also be a good homework assignment. Includes summary and wrap-up questions to help students evaluate the information and to make comparisons to earlier studies of the U.S. or other parts of the world. This lesson is part of a 10 day complete unit available in my TpT store. 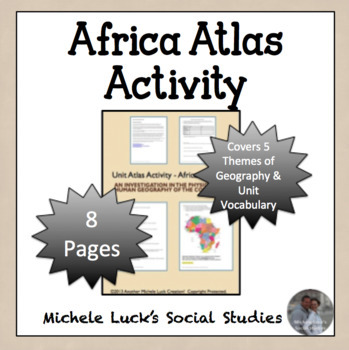 Look for the Africa Complete Unit for fun activities that are student centered for optimal learning and skills practice. Other activities, games, student assignments and complete units are available for Geography, World History, and U.S. History at my TpT store! Check back often for even newer materials!